304 pages | 61 B/W Illus. In recent decades Japan has changed from a strongly growing, economically successful nation regarded as prime example of social equality and inclusion, to a nation with a stagnating economy, a shrinking population and a very high proportion of elderly people. Within this, new forms of inequality are emerging and deepening, and a new model of Japan as 'gap society' (kakusa shakai) has become common-sense. These new forms of inequality are complex, are caused in different ways by a variety of factors, and require deep-seated reforms in order to remedy them. This book provides a comprehensive overview of inequality in contemporary Japan. It examines inequality in labour and employment, in welfare and family, in education and social mobility, in the urban-rural divide, and concerning immigration, ethnic minorities and gender. The book also considers the widespread anxiety effect of the fear of inequality; and discusses how far these developments in Japan represent a new form of social problem for the wider world. 1. After the Banquet: Economic and Demographic Stagnation since the 1990s, David Chiavacci and Carola Hommerich. 2. Institutions and Actors in the Creation of Social Inequality: A Rational Choice Approach to Social Inequality, Yoshimichi Sato. 3. The Gap as Threat: Status Anxiety in the ‘Middle’, Carola Hommerich. 4. The "Re-segmentation" of the Japanese Labour Market: Investigating the Impact of Industrial Dynamics, Sébastien Lechevalier. 5. Does Employment Dualisation Lead to Political Polarisation? Assessing the Impact of Labour Market Inequalities on Political Discourse in Japan, Steffen Heinrich. 6. Are Labour Union Movements Capable of Solving the Problems of the ‘Gap Society’? Jun Imai. 7. Economic Inequality among Families with Small Children in Japan: Who Provides Welfare to Children? Sawako Shirahase. 8. Social Policy Responses to the ‘Gap Society’: The Structural Limitations of the Japanese Welfare State and Related Official Discourses since the 1990s, Harald Conrad. 9. The Old and New Welfare Politics in Japan: Persisting Obstacles for Reform, Margarita Estévez-Abe. 11. Political Discourse and Education Reforms concerning "Equality of Educational Opportunity", Akito Okada. 12. Trying to Reduce Inequalities in School: The Academic Discourse and the Concept of ‘Effective Schools’, Julia Canstein. 13. The Urban-Rural Divide in Japan: A Matter of Social Inequality? Ralph Lützeler. 14. Public and Political Discourse on Socio-Spatial Inequality in Japan, Volker Elis. 15. Understanding the Dynamics of Regional Growth and Shrinkage in 21st Century Japan: Towards the Achievement of an Asian-Pacific ‘Depopulation Dividend’, Peter Matanle. 17. The "Multicultural Coexistence" Discourse in Crisis? Public Discourse on Immigrant Integration in the Gap Society, Takashi Kibe. 18. Understanding the Gaps Between Immigrant Economic Outcomes: Strategic Action and Meaning Making among Newcomer Immigrants in Japan, Gracia Liu-Farrer. 19. 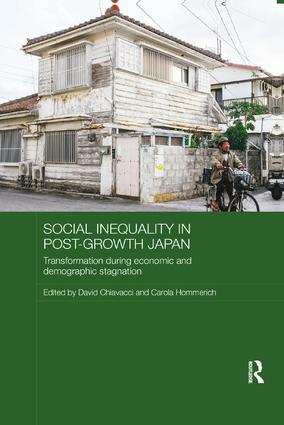 Reassembling the Pieces: The Big Picture of Inequality in Japan, David Chiavacci and Carola Hommerich. David Chiavacci is Mercator Professor of Social Science of Japan at the University of Zürich, Switzerland. Carola Hommerich is Associate Professor of Sociology at Hokkaido University, Sapporo, Japan.